I know. The picture looks like a mess. It is a mess. Please, don’t let it discourage you from trying beets out. They make a grounding and colourful lunch. They are one of the most interesting cooking ingredients. Their unusual, caramelized flavour is drawn out by roasting. If green vegetables and spinach are on the top of your favourites, beets won’t disappoint you. Their stalks and leaves are wonderful. Quickly boiling them in a small amount of water will give you a hearty salad. It is called horta vrasta (xορτα bραστα) in Greece. It is often made with wild greens and ranges in taste from bitter to sweet. A friend of mine, Dharma Rupa, who taught me how to make it, added a squeeze of lemon and extra virgin olive oil with a pinch of salt to the boiling water. The beets, lemons and olive oil came directly from her family garden, and to this day, I’m yet to taste anything more vital than her horta vrasta. If you want the leaves to remain bright green, add lemon and olive oil only after cooking. Scrub the beets until clean. Roast (with lemon wedges) in 225 C until soft. Wash the greens and stalks well. Place in a pot . Add enough water to cover the bottom of the pan. Add lemon, olive oil and salt. Boil until the stalks are soft but firm. If there is any water left, sieve it out (save, use in cooking). Add some extra lemon juice, olive oil and pinch of black pepper if you like. Serve with roasted beets, fresh yoghurt or sour cream as a side dish. Garnish with fireweed flowers or other herbs. What a delightful treat for a beet lover! I always wanted to make various dishes from the beet leaves but couldn't try other than a simple curry. This is a sure treasure recipe. What a beautiful post, I'll definitely try this one! Loving the messy look here. I guess messy is the new black! Now I have to ask- how many different wooden boards have you got? You are always so co-ordinated! Laksmi, the photo is a wonderful, adorable mess!!! Sanjeeta, you won't find a more simple recipe than this! If the beets are fresh, the taste is tantalizing. It is full of prana. Sukhaina...I have a couple of boards :-) Actually, I'm an opposite of a hoarder and try to keep things as simple as possible. Therefore I rather paint over again & again the existing ones than get new ones. I use acrylic colors that dry within 10 minutes (and are filled with toxic fumes). Recently I developed a new method to achieve an interesting and lively surface. Maybe I'll share it with you in one of the posts in the future. Notyet100, I'm happy you see it that way. I'm not yet where I'm getting at, but enjoying the process and learning day by day. Zita, thanks. I'll show how to make such a board one of these days. I like roasted beets and olive oil over it too. :) Lakshmi, your picture of the beet with greens (second one) is excellent! 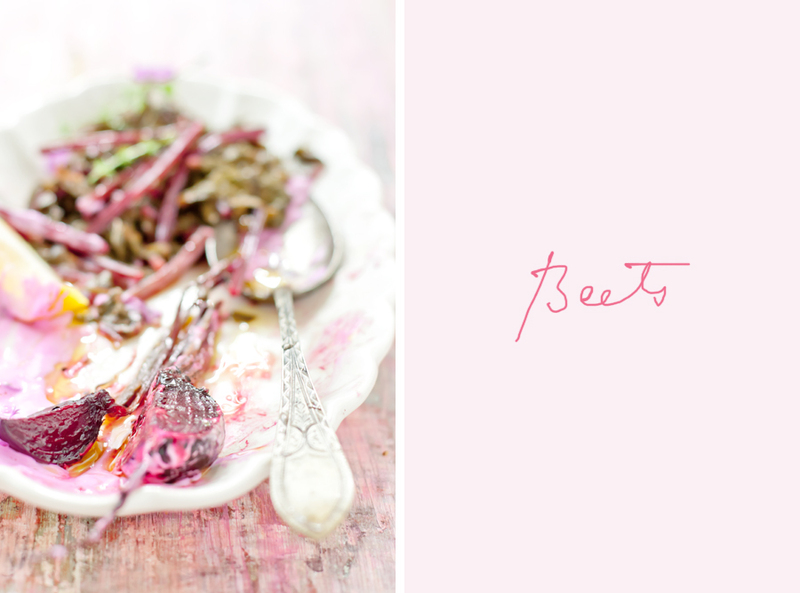 I love this beetroot mess! gorgeous pic...so happy to be on ur blog finally can say i'm enjoying this phase of fresh veggies in market ...have to try one of ur recipes very soon! That is the best looking mess I have ever seen! Love the recipe... when I see fresh vegetables I just never can bring myself to mess with it too much.I like to keep it as simple as possible to keep the real flavours of the vegetables intact. This really looks like a fabulous way to eat sweet beets! I love beets, do not miss' this to try your recipe, I really like this "mess"
yes please....pretty please with beets on top?! would love a tutorial on board making very soon! Loving the mess here! And beet roots are one of my fav too. I even like to boil them along with lentils and get those juicy chunky bite as I sip the warm lentil soul. I think this dish is beautiful, not messy at all. What a beautiful way to enjoy sweet beets. Beautiful photos. This looks so good. I did not realize you could eat the stems too. 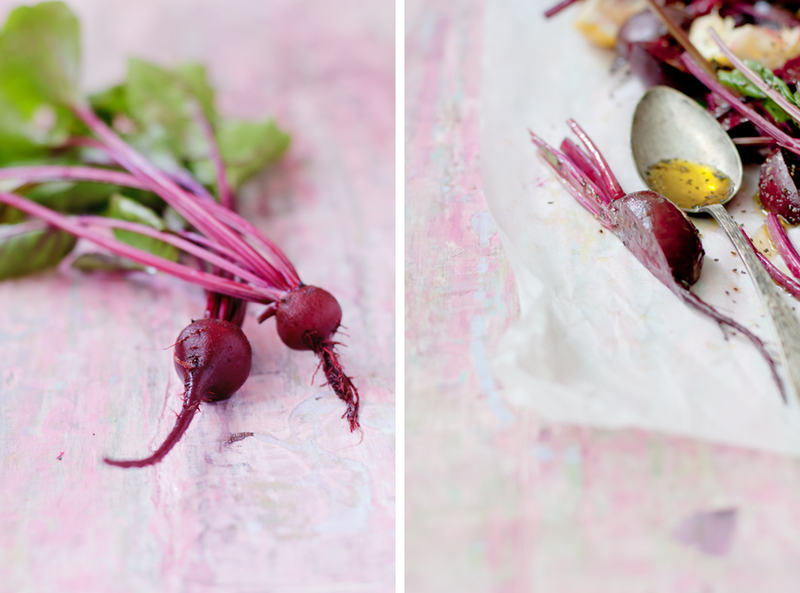 I love beets-they are not used often enough. Thanks for sharing. Oh yeah-and your "mess" looks sooo delicious! Great photos. lakshmi, first time at your blog and I am blown away, what beautiful photos and recipes, your blog layout is very appealing . So glad to have stumbled upon ur blog. If that's a mess, I don't know what you'd call my lunches ;p. I confess I find savory foods harder to photograph, but I absolutely love your shots here (as usual). I also enjoy the taste of beet greens very much and try to use them as long as they're not too dried up, wilted, and gross. Thanks for sharing another delicious recipe! This mess is real and sensual. It's an invitation to discover your dish. Love it Laksmi! 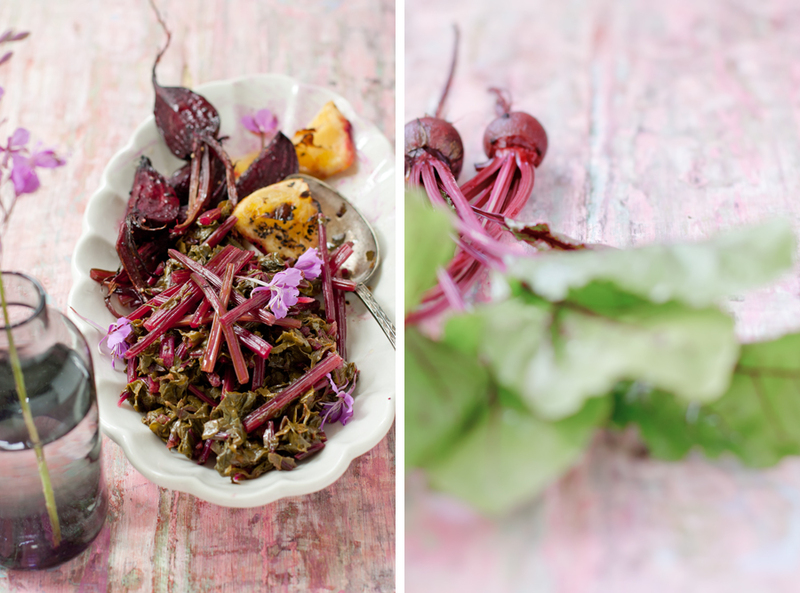 I have a beets and greens recipe on my blog as well, but yours looks very pretty - not a mess at all. This recipe looks scrumptious! And messy or not those shots are gorgeous! I have some beets sitting in my fridge now. I think I know what I am going to do with them now. Wow, that looks delicious. I can't wait to try it! I just harvested a lot of beets! Wish I could get hold of some beet leaves, I wanna try this. Never thought of using beet leaves/stalk before and I'm in my mid thirties. How ignorant! Hey sweetie, all your images ooze grace and a rustic charm. I've fallen head over heels for your signature style. Wish I could capture food this way, but sigh, I know my limits! Also, your props are simply beautiful...very signature you. Actually the picture looks great and tasty. I love beet greens. And the are healthy too. can't wait to try your recipe!